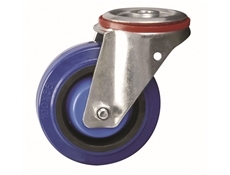 These Bolt hole fitting medium duty castors with elastic rubber tyre with nylon centre are available in diameter sizes: 80mm, 100mm, 125mm, 160mm, 200mm. 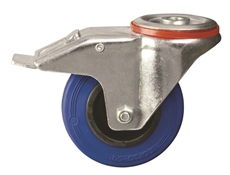 These castors offer a load capacity ( diameter dependent ) ranging from: 150kg, 200kg, 350kg, 400kg. Available in braked or swivel options.